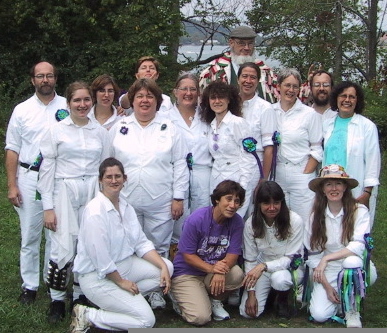 Thornden Morris is a women's Morris dancing team in Syracuse, New York. It takes its name from Thornden Park, where its annual May Day celebration is held. Its banner shows a rose, symbolic of the Rose Garden in Thornden Park. The Thornden Morris team is currently practicing on Tuesday nights from 6:00 to 7:30pm at the New School on Jamesville Ave. New and prospective members are welcome to visit! Just call (315) 471-7591 or send email to Nancy McCracken at njm@ecs.syr.edu to make arrangements, as practices are sometimes rescheduled. For the 2016 season, we are focusing on the Fieldtown and Bampton Morris traditions. For the latest news and events, please see our Facebook Page. You may also want to check out the homepage of another Morris team in Syracuse: Bassett Street Hounds, a mixed Border Morris team. Other teams appear on the Wikipedia Morris Teams Directory.